It surprises some to know that, even thought I am a writer and lover of words, I have never been an avid reader. However, one of my 2015 resolutions was to read at least six novels. In February of last year, I made a list of books I wanted to read and actually read seven during the year! Seven may not seem like a lot to some people, but going from zero to seven was a big accomplishment for me. I've really enjoyed reading and want to keep it going. One thing that helped a lot last year was having a list at the ready. So, I decided to make another list this year. I asked for suggestions on my Facebook page; checked out suggestions from Amazon, Barnes and Noble, and Goodreads; and read book reviews from my reading hero and blog friend, Dana to come up with this list of 10 books I hope to read in 2016. After You by JoJo Moyes - This book is the sequel to Me Before You which I read in 2015 and LOVED! The Nightingale by Kristin Hannah - The story of two Parisian sisters, each on their own path of survival in WWII occupied France. I've been told this book is brilliant and it has been highly recommended to me by multiple people. Passenger by Alexandra Bracken - This is one I chose based solely on the online synopsis. A little bit of historical fiction; a little bit of time travel; a little bit of romance; and a little bit of mystery all rolled into one. Brooklyn by Colm Toibin - The story of Ellis Lacey, who grew up in small town Ireland after WWII and then is given an opportunity to come to America where she finds work and love. Fates and Furies by Lauren Groff - The truths and secrets of a marriage from different perspectives over a twenty-four year period. City on Fire by Garth Risk Hallberg - set in New York City, 1976. A diverse group of people who are all somehow tied to the mystery of a shooting in Central Park. Every Day by David Leviathan - I was intrigued by Dana's inclusion of this book on her Top Ten Books of 2015 list. The story of a man who wakes up in a different body, a different life every day. The Magic Strings of Frankie Presto by Mitch Albom - To quote Goodreads, "This is the epic story of Frankie Presto - the greatest guitar player who ever lived - and the six lives he changed with his six magical blue strings." Before I Go To Sleep by S.J. Watson - Recommended by a friend on Facebook (Thanks, Teresa L.! ), this is the story of a woman, Christine, who loses her memory every time she falls asleep. The Martian by Andy Weir - Before it was a Matt Damon movie, it was a novel about astronaut Mark Watney who finds himself stranded and completely alone on the surface of Mars. I'm not usually a sci-fi fan, but this one seems to have just enough "real life," humor, and suspense to be interesting to me. Hopefully, by Dec. 31st, I can come back and report on my success in getting all the way through the list and maybe even add some reviews! Have you read any of these? What did you think of them? 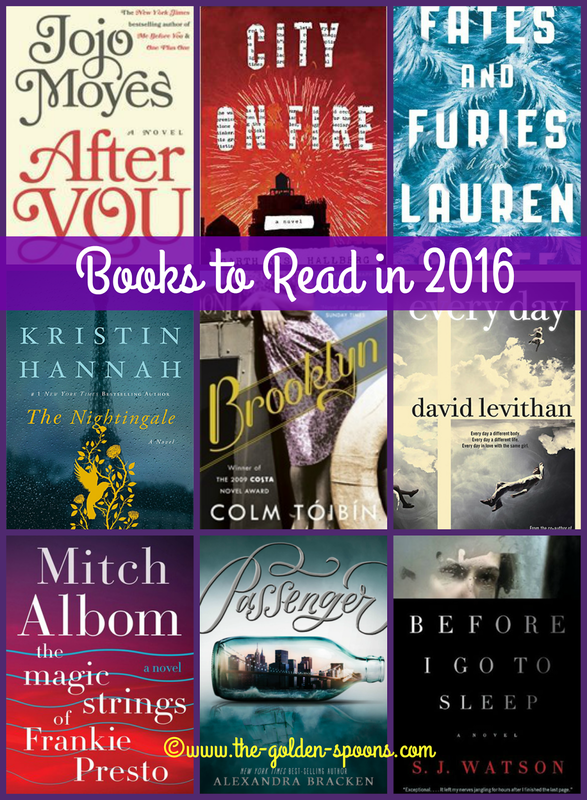 What books are on your list for 2016? This post was part of the One Word Blog Linkup hosted by, Janine of Confessions of a Mommyaholic and me! This month, the word prompt choices were Never, Old, and Brilliant.